Przemyslaw Tkaczyk have recorded some very cool Amiga AGA demos that is been played on Vampire 600 for Amiga 600. 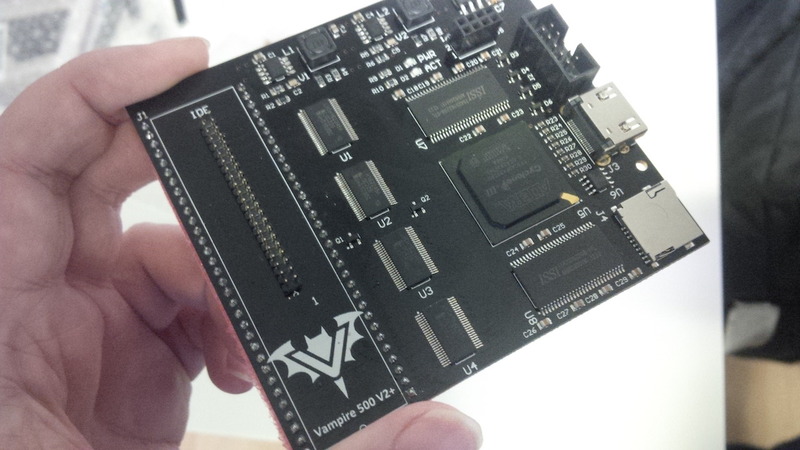 So, very soon every Amiga that got a Vampire V2 or higher will be able to play AGA Amiga demo content which also includes demos made by the amazing Amiga demoscene. He recorded some heavy Amiga AGA demos, with early GOLD3 beta core that Przemyslaw is testing at the moment. Each one is a realtime output from his Vampire V600 HDMI (both audio and video, pure digital stream) at 720×576@50. Unique “Subside” Amiga AGA Demo (Vampire 600 V2) from Ghostface on Vimeo. With GOLD 3 release in the end. You will not only be able to play AGA Amiga demos. But you will also be able to play AGA games and use software too. Both picture and sound will also flow thru the HDMI directly also, so you can get the music and sound effects thru it instead of Paula. Personally I love the Paula sound, so I will keep the last GOLD that still keeps the Paula sound and then use the Pamela sound thru HDMI on another Vampirized Amiga. Unique “Singularities” Amiga AGA Demo (Vampire 600 V2) from Ghostface on Vimeo. It will for sure be really great to see all Amigan’s get the very same standard. With this move, Apollo Team will make sure that those coding for RTG equipped Amigas will have enough power. With 68080 power, all of the Amiga home computers will be able to deliver way more. People will also be able to have way more fun too and that will result in happier users for sure. To be able to watch films, listen to mp3s and at the same time play nostalgic software is ideal for sure. GOLD3 when its out will change a lot for the better for Amiga. Thanks to Przemyslaw and everyone at Apollo Team for moving the Amiga forward!